Andy Flower is confident that the lessons England have learned from their tour of the UAE will stand them in good stead when they arrive in Sri Lanka next month for two Test matches. England lost the Test series against Pakistan 3-0 in the UAE, with the visiting batsmen unable to counter the hosts' spin attack. But Flower, the team director, has been encouraged by the improvement his team has shown over the course of the tour and feels they will have benefited from the learning experience. England won the ODI series 4-0 and, having lost the opening Twenty20, levelled the series with victory on Saturday. Both squads have now moved on to Abu Dhabi where they will contest the final game of the tour - the deciding T20 - on Monday. The two-Test tour of Sri Lanka follows from March 10. While Flower accepted that England's batsmen had struggled throughout the Test series, he felt their improved performances since the start of the limited-overs section of the tour augured well for the future. Kevin Pietersen, for example, having averaged just 11.16 in the three Tests, bounced back with successive centuries in the ODIs and finished that series with an average of 93.66. Alastair Cook's figures for the same two series - 26.50 and 80.75 - tell a similar story. Jonny Bairstow, having come into the T20 side, also impressed with a unbeaten match-defining innings of 60 to win the second match. "It's been a really fascinating tour," Flower said. "It's been surprising that we lost the Test series 3-0 and then won the ODI series 4-0. It's exactly the opposite of what most people would have expected. "We've learned some good lessons from the Test experience. You can see some of the learning coming out in some of the batsmen at the moment - which is great to see - it would be very disappointing to go through those tough experiences and not come out the other side as better players, but I think some of them are coming out the other side as better players. "A good example would be Kevin Pietersen who has turned round his form. He has shown us a different method in the one-dayers. He has worked very hard re-jigging his method and it's nice to see that it's working for him. It's nice to see him playing as confidently as he is playing at the moment; that's great to see. "Alastair Cook also had a tough Test series - like most of our batsmen - but played superbly in the one-day series to show the requisite skills you need in these conditions. "A young guy like Jonny Bairstow has shown that he has learned from the first T20 game and showed a slightly different method against Umar Gul and against the spin. Those are good signs for me as a coach to see. The guys are learning and embedding those lessons: that's a very healthy thing for us in the future. Andy Flower is determined that England won't enter the Test series against Sri Lanka under-prepared after the team's experience in the UAE. After a two-month break before Christmas, England had two warm-up matches before the Tests against Pakistan started which, Flower believed, probably wasn't enough. This time the Test specialists - likely to be Andrew Strauss, Matt Prior, Ian Bell and Monty Panesar - will travel out before the rest of the squad to acclimatise. "Some of our Test squad are going to go out early - they're going to go on March 5 - as opposed to most of us who are going on March 10," Flower said. "So those players that aren't on this leg of the tour - the limited-overs leg - are going to go out early and take the opportunity to acclimatise and work on specifics to Sri Lankan conditions. Hopefully we can then avoid the slow start we had to this series, which was a big contributor to us losing this series." "Yes, the Test series against Sri Lanka is going to come round fairly quickly and that is a good thing. We've only got 10 days at home. We will have the challenges of turning pitches again, but that is good: I want to see that. I want to see if our Test batsmen have learned to play the spin better. I think we should see some good things out there from our team. 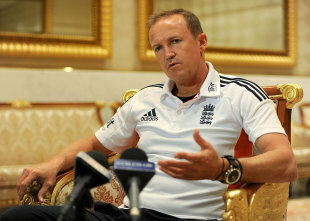 The batsmen may have struggled in the Test series, but Flower was delighted with the performance of England's bowlers. He also suggested that, while Steven Finn's ambitions to break into the Test team had been frustrated of late, it was only a matter of time before he becomes an established Test cricketer. Finn was not called upon for the three Tests against Pakistan, but claimed 13 wickets at a cost of just 10.3- apiece to help England win the ODI series. "The bowlers have been consistently good," Flower said. "The quick bowlers, led by James Anderson and Stuart Broad in the Test series and by Monty Panesar and Graeme Swann in the spin department, have been outstanding. And that's carried on into the one-dayers. It's been really nice to see Steven Finn perform as he has done. He's a big strong man now and he's quite a mature young man and he's a genuine wicket taker. He's been performing that role for us in the limited-overs stuff and because of it he'll be pushing hard for Test selection as well. "There's no doubt he will play Test cricket and quite a lot of it I'd think. When and in which circumstances - and how his competition for a Test place play - will determine how quickly that happens. But he's doing all the right things and he's helping England win games of cricket." Flower also took encouragement from the way that England bounced back from defeat in the first T20, though he did warn that Monday's game represented his side's last opportunity to play T20 cricket in Asian conditions ahead of September's World T20 in Sri Lanka where England will defend their title. "We didn't do anything hugely differently in the second T20 game from the first," Flower said. "In that first game we put ourselves in a very strong position to win. We had 35 to get off the last five overs with seven wickets in hand. There was some really good death bowling from Saeed Ajmal and Umar Gul that ensured that we didn't. That was a great experience for our young players especially. In the game that we won, I thought Jonny Bairstow's innings was outstanding. "The experience that those guys will have gained in a pressure situation against very good opposition in these conditions will be absolutely vital to their growth and to our growth as a side. We have to have, at this stage, an eye on the World T20, which is in Sri Lanka in six or seven months time and therefore how we play against these spin bowlers in these conditions - and how quickly we learn - is vital to our chances in Sri Lanka. "There are not many T20 games to go and most of those are in England, so it will be a different type of cricket and a different type of T20 cricket. So we have to make the most use of this next one and then we move on to different forms of the game at the start of the summer. But this experience out here has been great for us."